Thousands of chamber-music lovers from 20+ countries and 30+ U.S. states will visit southern Vermont to attend the Marlboro Music Festival each summer. We produce an exclusive annual Visitors’ Guide to help our patrons find options for dining, lodging, and activities around the festival and throughout the region. 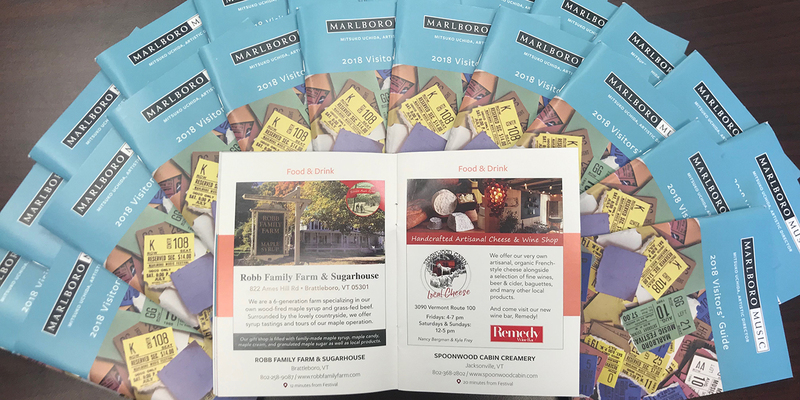 Each advertiser receives a full-page ad and map listing in our printed visitors’ guide as well as a full-page profile on our website. • All ticket buyers receive a printed copy with their ticket orders. • Guides are prominently displayed in our lobby during concerts and open rehearsals. • We circulate the guide throughout the area and will send several copies to you for display. Click here to view ad specs. If you need help designing or adjusting your ad, we’re happy to help at no extra cost. Questions? Contact us at 215-569-4690 or info@marlboromusic.org. We usually begin putting print ads together in early spring though we can make online ads at any time. Let us know if you would like us to add you to our advertiser mailing list for a spring reminder about organizing your Marlboro ad for the next summer. The Plan Your Visit section of our website allows for more room and photos. Feel free to give a longer description of your business or organization to help us reflect you best! Please provide your ad, or provide assets such as your logo, photos etc that we can use in designing your ad. If you would like us to use previous materials, just let us know in the description box.